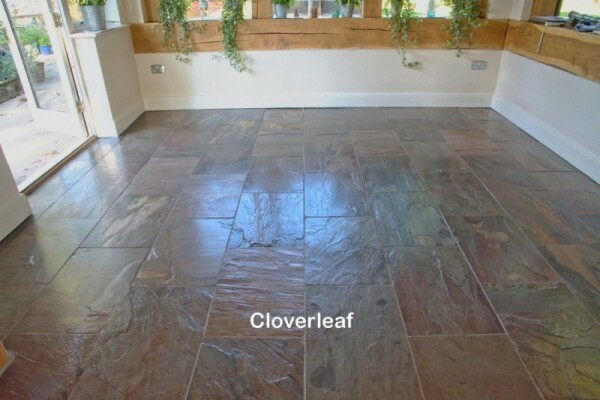 Slate Floors Cleaned, Restored and sealed in the Cheshire area. 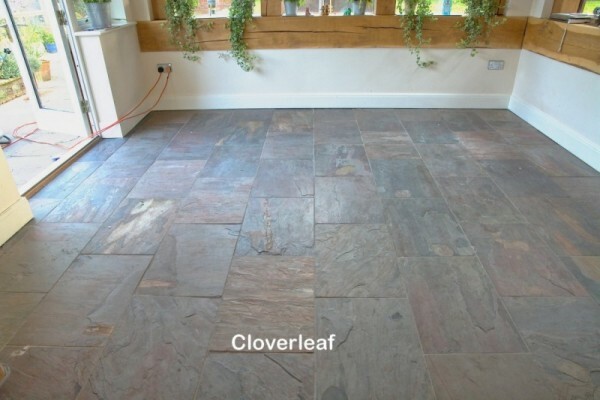 Slate floors are laid in many colours and textures. Periodic or regular cleaning and maintenance and will prevent unsightly dirt from building up. Cleaning will also enhance the beautiful colours and keep them looking as new. 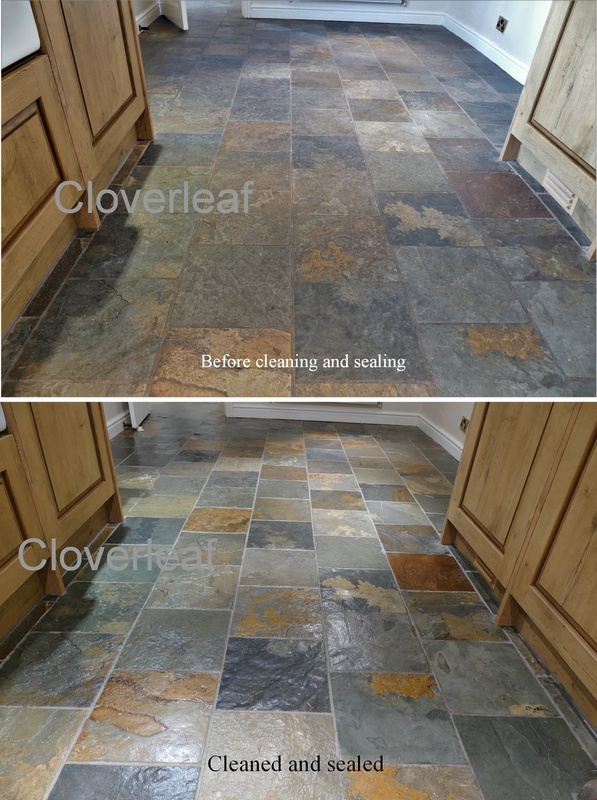 If your considering having a slate floor restored in Cheshire, please see the images down the page. 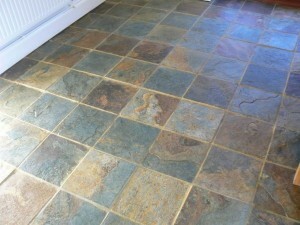 Stone slate flooring tiles are very popular due to the many different colours and designs available. This type of flooring varies density and composition. 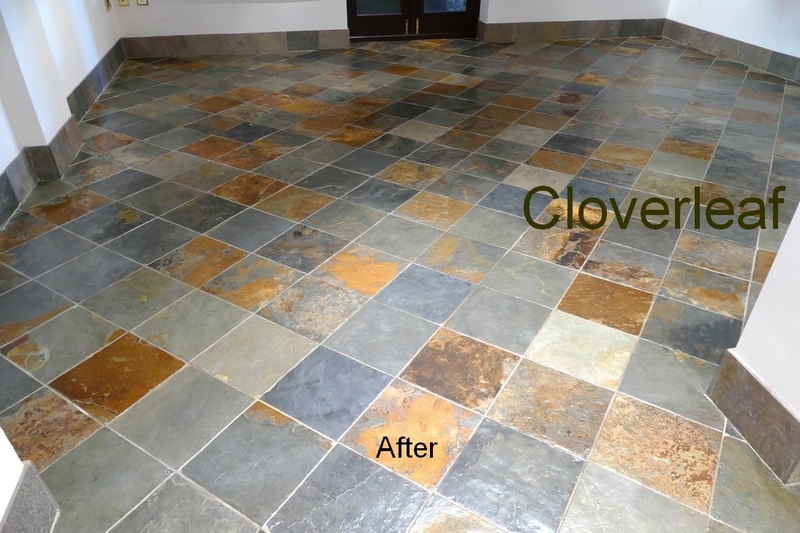 Most types of slate stone floors are porous and it is important to apply some sort of polish or sealant once the floor has been machine cleaned. Several types of polish and sealant are available which will help prevent spillages and dirt being absorbed into the stone slate tiles. Many types of sealant or polish can also help prevent the floor from shedding loose particles of grit and dust and create a fine permeable finish which is easy to maintain and clean. Our cleaning process can remove years of grime and dirt to reveal a fresh new floor surface. Before the slate floor was restored treated and cleaned. 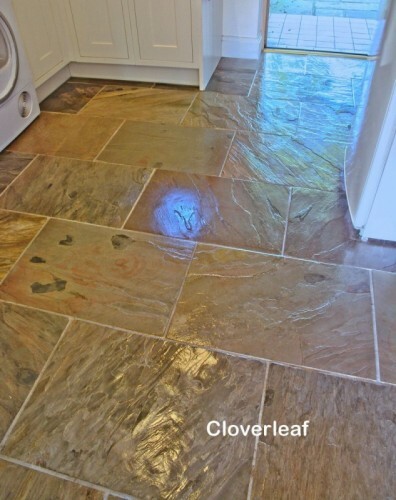 Slate floors can look beautiful if maintained in the proper way. 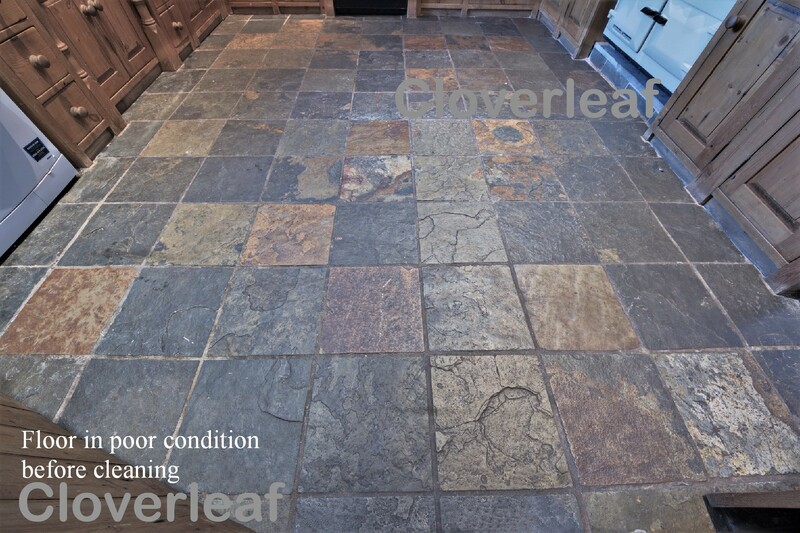 This image shows a slate floor that had been neglected and probably never sealed. Dirt and soil had been absorbed into the stone and was impossible to clean by mopping. Also the floor would release dust grit and stone particles. The floor was stripped clean and a satin finish applied. The floor is now easy to mop and keep clean. Spillages are now easy to remove will not soak into the tiles. An old slate floor cleaned and sealed in a Cheshire Cottage. 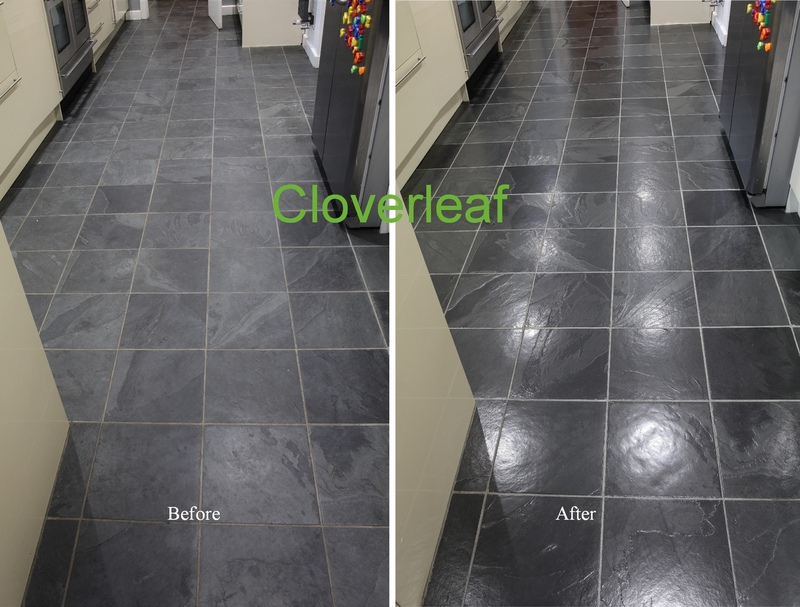 The client needed advice on how their Slate Floor could be cleaned in Nantwich Cheshire. We advised that the floor could be successfully cleaned and an appropriate floor seal – polish could be applied which would make the floor easier to clean, enhance the colours and would last for many years. On the initial visit a test patch clean was carried with a no obligation quotation. 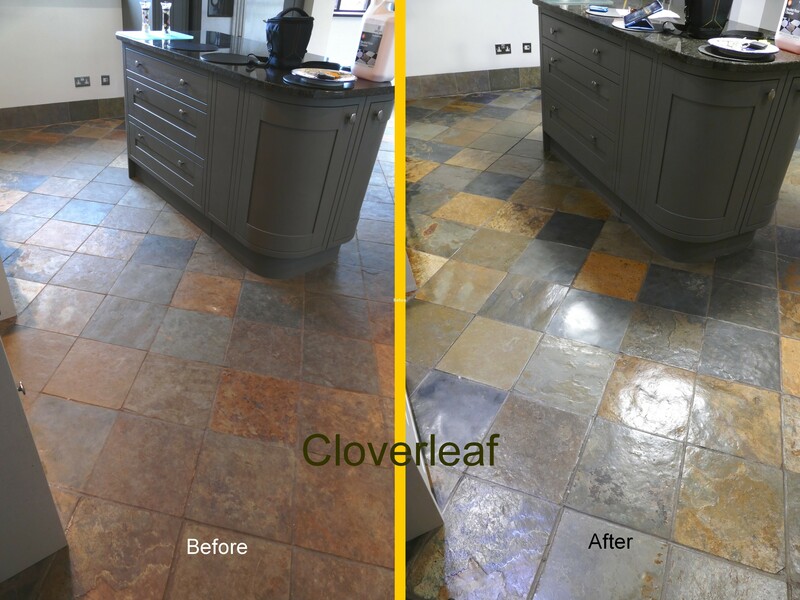 As seen from the photo’s below, the floor has been dramatically transformed from an old and dirty floor, to a lovely clean slate floor with a impressive lustrous satin sheen finish. Satin sheen slate floor seal polish. 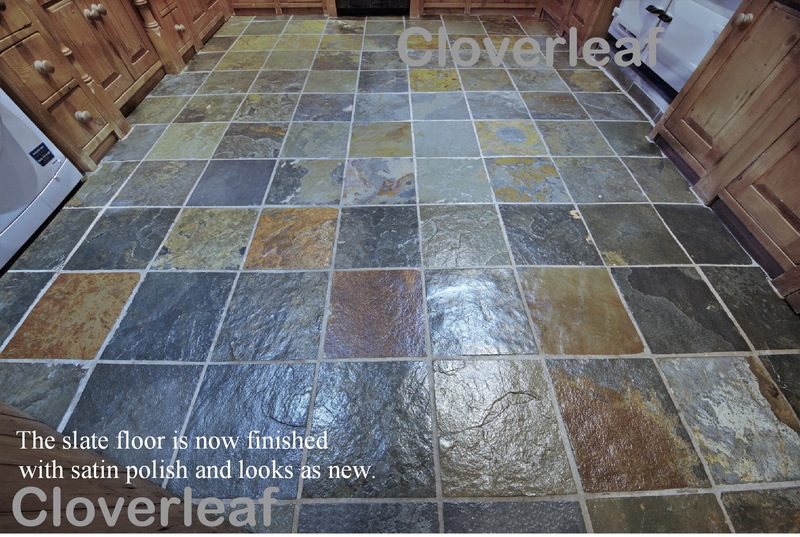 Below is a slate floor which was in poor condition. The slate floor was stripped clean including the grout. The floor was finished with a satin sheen polymer polish. 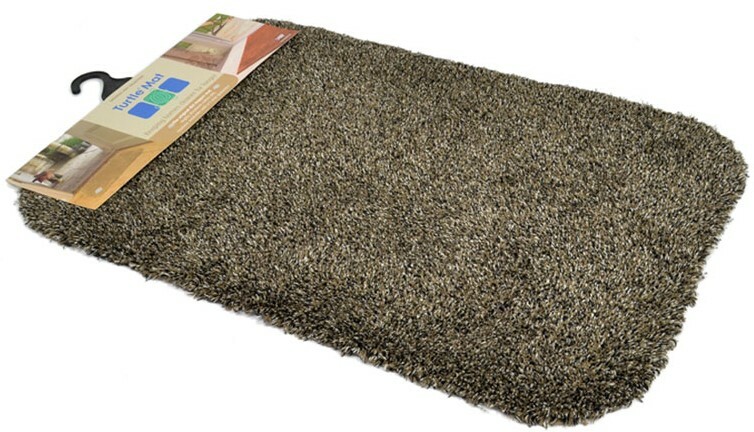 The floor is now easy to mop and maintain with a lovely smooth non absorbent finish. 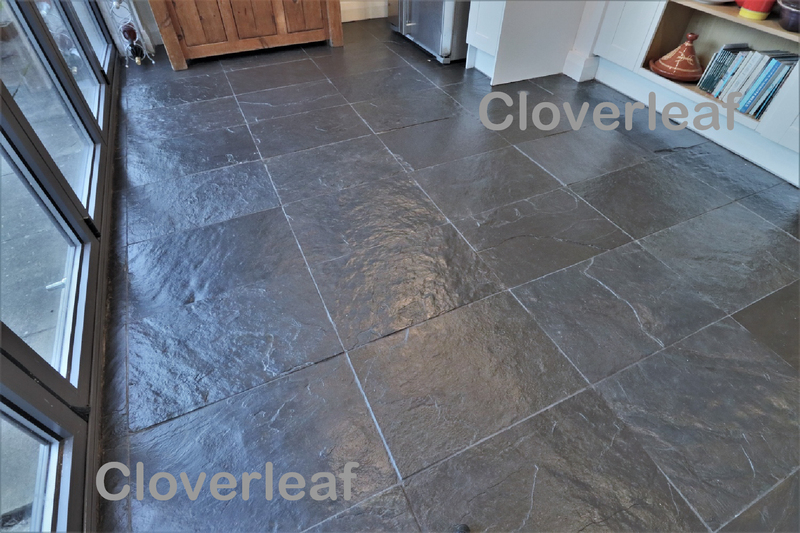 Below is a slate floor that required maintenance in Tiverton near Tarporley. The existing polish had worn off after many years of use and had become dull and difficult to clean. The floor was cleaned and and a treatment of LOW SHEEN SATIN polish was applied enhancing the lovely colours. Below is a grey slate floor that was cleaned in Altrincham Cheshire. This floor had been down several years and had never been sealed making it difficult to keep clean. The first image shows the floor before it had been stripped and cleaned. The second image shows the floor cleaned and sealed with a satin finish. The floor is now easy to keep clean and will not stain from spillages. 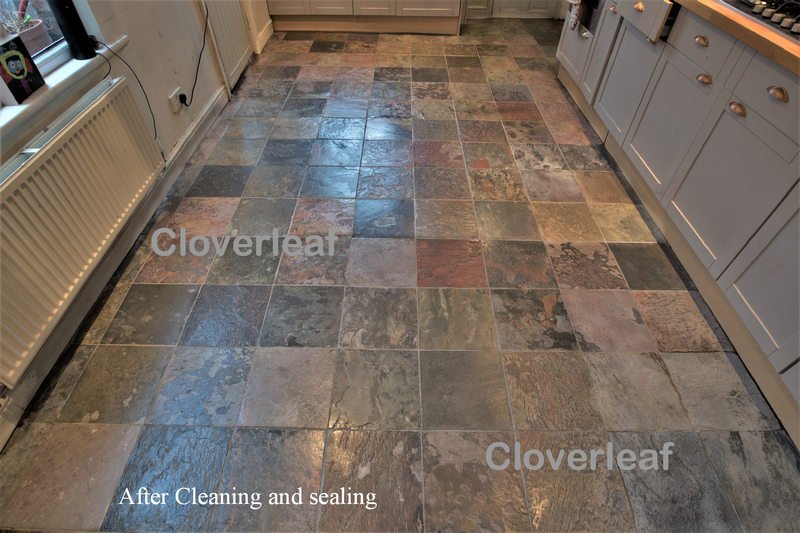 Below are images of a Slate floor restoration for a regular client in Tiverton Cheshire. The client was tired of not being able to clean the Slate properly. Also when drips from food preparation were spilled on the floor they were proving very difficult to scrub out due to being absorbed by the Slate tiles. The client required that the floor be cleaned and sealed to both the kitchen and utility room. The image below is before the cleaning took place. In the image below, the floor has now been cleaned and sealed with a low sheen polish which will protect the floor from staining and now be so much easier to clean. 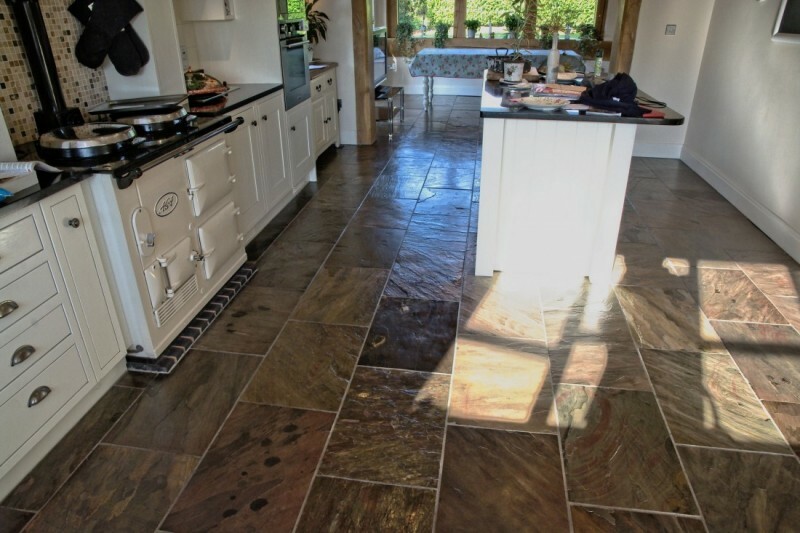 Below is a view of the Slate floor in the kitchen area. The satin polish has brought out the lovely colours in the slate while making the kitchen look much warmer and transforming the living space. Below the floor in the utility-laundry room was cleaned and sealed with a high gloss finish. The high gloss finish gives depth to a small space and also the floor is very easy to clean and will not stain from spillages. Below is a slate floor that was cleaned in Wirral Cheshire. This floor had also been down many years and had never been sealed. 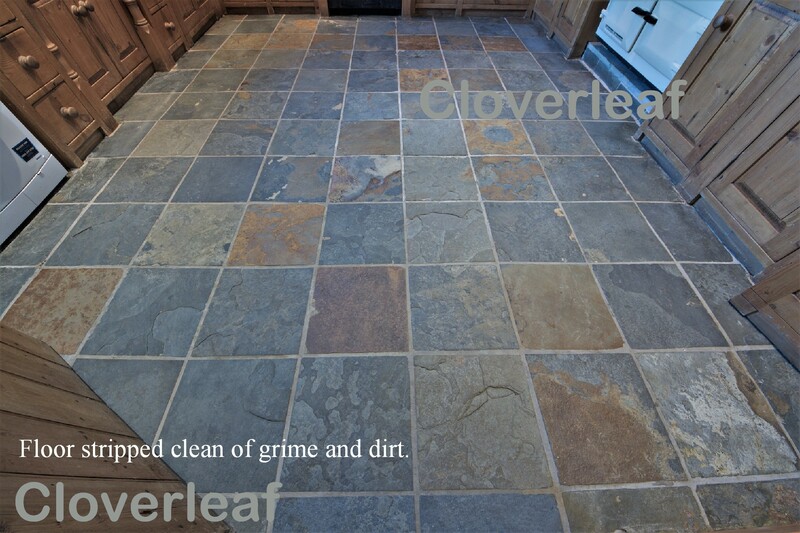 The images show that the Slate floor in the kitchen area was dull and soiled. Mopping just would not clean it. Click images to enlarge. The floor has now been stripped clean with several coats of satin finish polymer which will last for years. Click image to enlarge. In the same room around the kitchen units. The difference between how the floor used to look and when finished is quite dramatic. When the customer walked in to see the finished floor her words were ”Wow….it looks amazing!”. The floor has been transformed so the colours now stand out and it looks gorgeous with a nice smooth finish. When being cleaned, the mop will now glide over the surface and be easy to clean and maintain. Click to enlarge image. 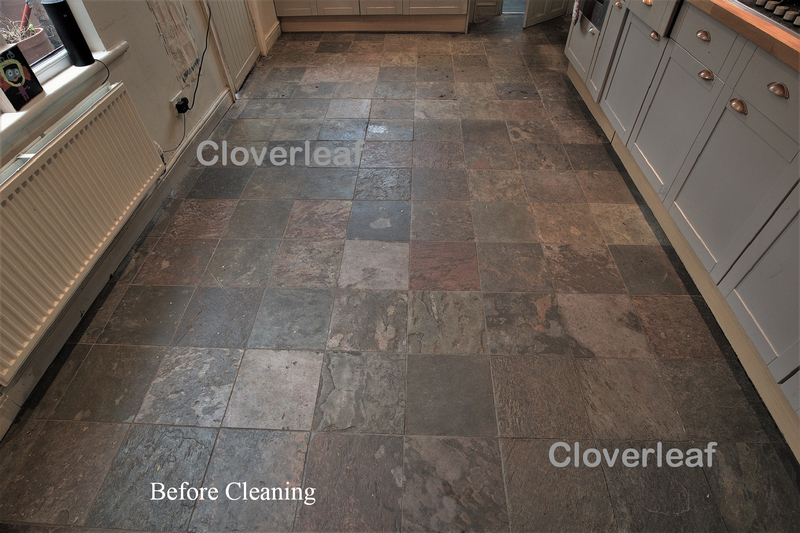 This slate floor in Crewe below had become quite soiled and impossible to mop clean. The client had tried to clean the slate floor herself without success. A heavy duty stripping chemical and abrasive were used to remove the old polish and dirt. The floor was then sealed with a polymer. The floor is now looking gorgeous again! Another heavily soiled slate floor cleaned and sealed in Macclesfield. 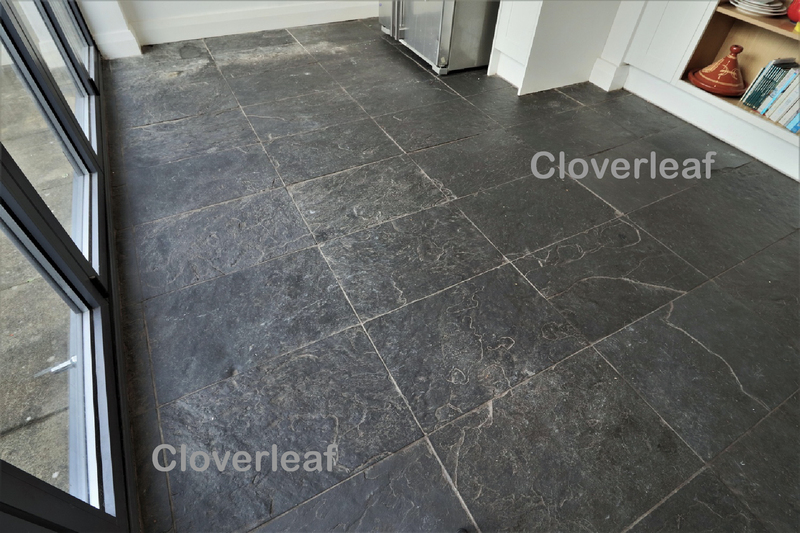 How do I get a quotation for my slate floor? How long would it take to clean and seal my slate floor? 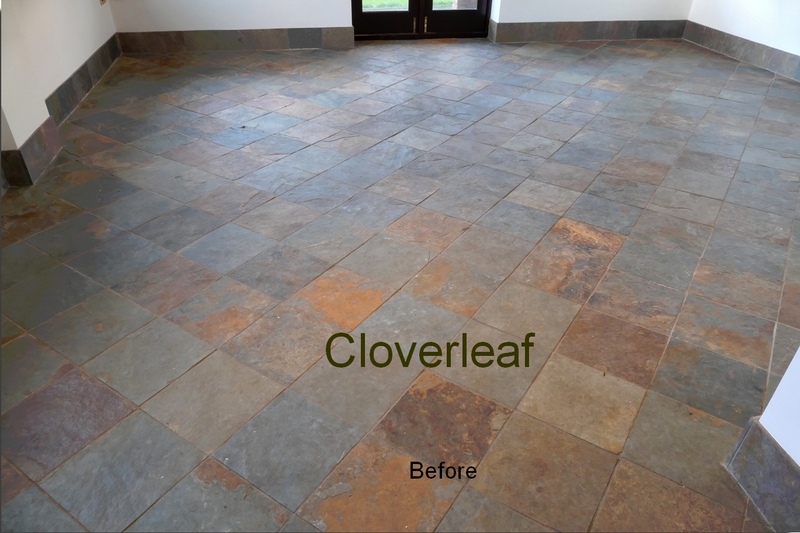 Most slate floors can be cleaned and sealed in one day. Larger floors may require two days to complete the work. What is the best way of sealing my slate floor and does it need sealing? Slate floors are very absorbent. If left un-sealed, not only will they absorb dirt but will also be susceptible to permanent staining. Additionally an un-sealed floor will be difficult to clean, subject to dust flaking and also unsightly once the original seal has worn off. There are many types of floor seals for slate on the market today including those supplied off the shelf from DIY shops and also supplied from commercial suppliers. We only use commercial high grade polymer sealers that are durable and have a long life expectancy. Additionally we find that our clients differ on which finish they want. There are three types of finish which are high gloss or wet look, satin finish which is slightly reflective or a low sheen finish which is not so reflective. No matter which type of finish you choose, the colours of the floor will be enhanced and look great again! Will my slate floor be easy to clean once it is cleaned and sealed? Once your floor is cleaned and sealed it will have a highly durable polymer finish which is smooth and will no longer attract dirt. Mopping the floor will now be easy and there will be no dust coming up from the floor. The only advice we have for cleaning is the use of a neutral floor cleaner which we can supply on completion of the work. Once the floor has been sealed it is essential that no harsh cleaners are used on the floor. Free quotes and advice. If you require a friendly free no obligation assessment and quote for your slate flooring, please get in touch. We can visit your property to see what your requirements are and leave you with a quote for your consideration.